Welcome to the most ambitious project I've ever sought to take on via blog. This is part 1 of a . . . several part series discussing the book "When Helping Hurts" by Steve Corbett and Brian Fikkert. I've been wanting to discuss this book on here for the past few months as I think it will be helpful as a framework for understanding poverty alleviation on the whole and what my job (ideally) looks like, but also for readers (you!) to engage with and ask necessary questions we don't often think about. 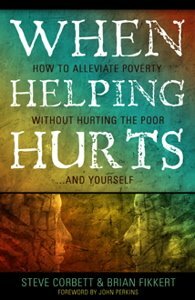 The basic premise of the book can be found in the subtitle, "how to alleviate poverty without hurting the poor . . . and yourself". The authors (successfully, in my opinion) argue that most efforts to address poverty as commonly carried out, both domestically and internationally, risk causing far more harm than benefit. They then go on to show how these mistakes can be redressed and avoided. But for this post, before I speak a word of content, I want to ask questions. Questions about how we define poverty and questions about how we view the "poor" and how we view ourselves. And . . . if this is about Christ (hint: it always is), are these assumptions and strategies grounded in the Bible? So, some questions to answer. I may or may not revisit and answer these questions in later posts, but you should answer them nonetheless . . . I'm serious. Get out some paper, or open a Word document. Write out your answers. So, the questions . . .
What is poverty? What words come to mind? List them. Based on that answer: What methods should be used to address poverty? Alright, write it out. I'll be back in a couple days with part 2. I'm excited about this . . . and if you know me much at all, you know what happens when I get excited!